Is your company ready for the new labor laws going in to effect this January? It’s important to stay informed and up-to-date so you can remain in compliance. 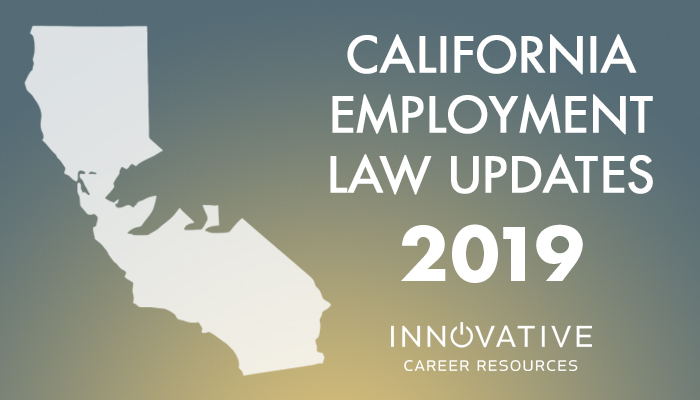 Here’s a quick rundown of some of the highlights of California’s employment updates. The standards for sexual harassment training have also been updated. Employers with five or more employees must provide two hours of sexual harassment training to supervisors and at least one hour to nonsupervisory employees within 30 days of hiring, and then one hour every two years thereafter. Internships are also under higher scrutiny. When deciding whether to offer paid or unpaid internships, consider who is the primary beneficiary of the intern’s work. If the company primarily benefits, then the internship must be paid. If the intern primarily benefits, the internship may be unpaid. However, the standards to meet are fairly stringent (see the Department of Labor’s Fair Labor Standards Act), so the best practice is usually to pay interns at least minimum wage. Drug testing categories are being expanded. Employers regulated by the federal Department of Transportation must include hydrocodone, hydromorphone, oxycodone, and oxymorphone to their drug-testing panel. This is in response to the increased opiate use across the nation. On the other side of the issue, California employers may want to modify their drug testing for marijuana. Between the legal use of medical and recreational marijuana, as well as the flood of hemp-based products to the market (edibles, topicals, etc. ), higher limits of THC may be acceptable. Although legal under state law, marijuana use remains illegal under federal law, so make sure your employment policies do not vaguely refer to “legal” or “illegal” drugs. Policies about your company’s position on marijuana should be clearly written and consistently applied. The rules for calculating overtime and aftertime pay have also been updated. Based on the ruling in Alvarado vs. Dart Container, bonuses must be included in the calculation for overtime pay. This only applies to flat-rate bonuses. Additionally, the case of Troester v. Starbucks has set a precedent for aftertime tracking. The California Supreme Court ruled that off-the-clock work that occurs regularly and generally takes four to ten minutes after the employee clocks out at the end of their shift was not considered de minimus (trivial), but rather labor that must be compensated by the employer. Companies should review pre- and post-shift practices, and take care to capture all employees’ working hours. As a reminder, the minimum wage will increase in January as well. Companies with 25 or fewer employees will be required to pay $11.00/hour ($13.25/hour in Los Angeles county), and companies with 26 or more employees will be required to pay $12.00/hour ($14.25/hour in Los Angeles county). Keeping updated with yearly changes to employment laws can be complex, but as an employer it is incredibly important. Make sure to update your employee handbook annually to address all the new laws. It is also important to ensure that your staffing partners are in compliance with current employment standards. Our team at Innovative Career Resources regularly attends legal updates, are proactive in our compliance, and would love to assist with your hiring needs. Contact us today to see how we can help you.